Land Rover Parts & Accessories. 2.7 TDV6 Full Performance Brake Kit. Land Rover Discovery 3 & Range Rover Sport 2.7 TDV6 Full Brake Set Full Performance Brake Kit all round for the Discovery 3 & Range Rover Sport, Includes Front & Rear Cross-Drilled & Grooved Brake Discs with OE Pads. 2x Front Cross-Drilled & Grooved Discs. Front OE Quality Brake Pads. Front OE Quality Wear Sensor. 2x Rear Cross-Drilled & Grooved Discs. Rear OE Quality Brake Pads LR019627 - Rear OE Quality Wear Sensor SOE000025. Have you seen this product cheaper somewhere else? We are an established Land Rover Specialist who stock and supply Quality Parts & Accessories for all Land Rover Models, which include. Series 2 & 3 - Defender 90/110/130, Discovery 1,2,3,4,5 & Sport - Freelander 1 & 2 - Range Rover Classic, P38, L322, L405, Sport & Evoque. Our company was introduced by Yorkshire's well known Land Rover Repair Specialist'Quattro Autocare' based in Riccall, North Yorkshire. We have 50+ Years combined Land Rover experience with an impressive workshop that uses the latest Diagnostic Equipment & Software. If you have any technical queries regarding any of our products, our trained technicians are here on hand and are happy to help. If this is something of interest please get in touch. We are an Allmakes/Terrafirma 4x4, Bearmach & Britpart Official Stockist & Distributor offering Genuine, OEM & Quality Aftermarket Parts, all at great prices! We are 100% confident we can provide the excellent service that you and your Land Rover deserve. You do not need to have an account. Weekend orders will be dispatched on the following Monday (Tuesday Bank Holidays). Larger/Heavier items upto 20kg in weight and 1m in length are sent via DPD courier. Larger/Heavier items over 20kg in weight and 1m in length are sent via TNT or Parcelforce. Unfortunately they do not give an estimated time slot so items can be delivered between 8am-6pm. Scottish Highlands, Islands, Northern Ireland, Isle Of Man and other Offshore areas with the following postcodes. AB31-38, AB41-56, BT, FK17-21, G83, GY, HS01-09, IM, IV, JE, KA27-28, KW0-99, PA20-99, PH15-99, TR21-25, ZE. (Max weight 30kg per parcel / upto 1m in length). Austria, Belgium, Denmark, France, Germany, Luxembourg, Netherlands, Republic of Ireland & Spain. We do not accept payments before collection. LR Trade Parts Unit 4D Selby Business Park. 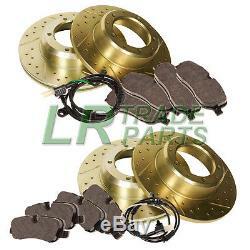 The item "LAND ROVER DISCOVERY 3 TDV6 FRONT & REAR PERFORMANCE BRAKE DISCS, PADS KIT SET" is in sale since Thursday, June 19, 2014. This item is in the category "Vehicle Parts & Accessories\Car Parts\Brakes & Brake Parts\Brake Component Packages". The seller is "lr-trade-parts-uk" and is located in Selby, North Yorkshire. This item can be shipped to United Kingdom.